This is a completely customized international royal wedding cake topper ordered by one of our customers. 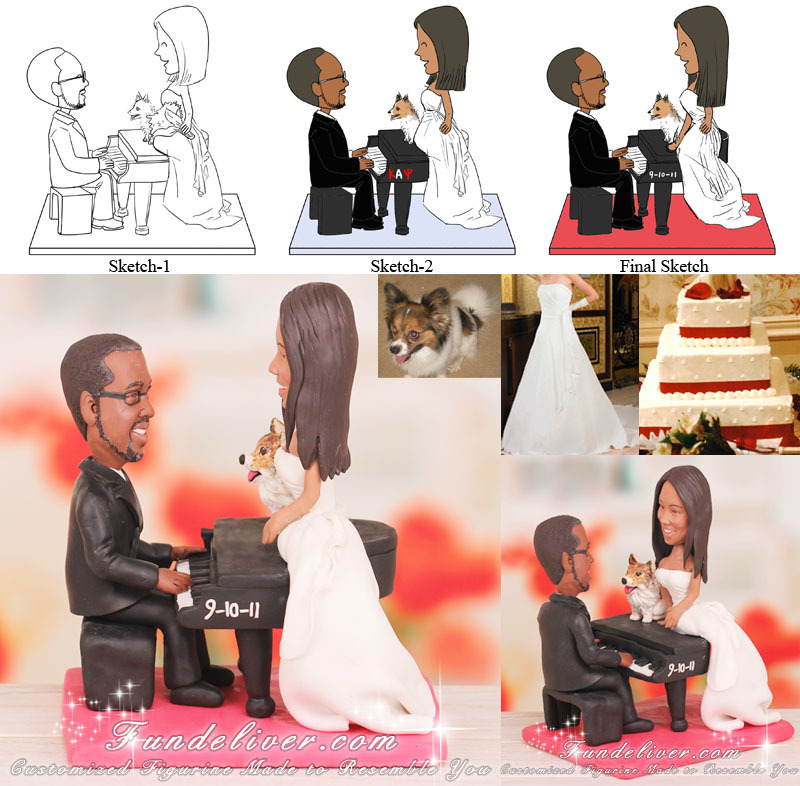 Our another piano wedding cake topper is the closest they have found to meet their dream cake topper. So they would a similar design with a little change. Their wedding theme is international royal wedding. Wedding date is Septmeber 10, 2011. Wedding colors: according to David's Bridal the colors are "Watermelon", "Wisteria" (purple), and Silver (accent color). Their wedding cake is like above image, "Watermelon" ribbon runs around the tiers of the cake. 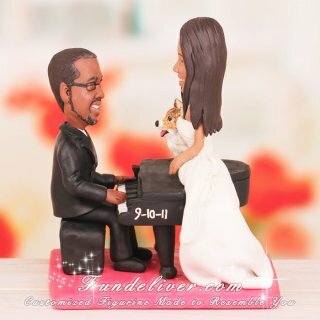 They would like a piano theme wedding cake topper to match their theme, colors and cake. They would like the groom to be in black tux, playing a grand piano and the bride to be in a white elegant dress sitting on top of the piano looking at the groom. Their dog is sitting on the piano next to bride, looking at groom too. His name is Richard, he has brown eyes and a horizontal oval patch of brown on each side of his body and completely white back. They also would like to put 9-10-11 on the side of the piano to accent their wedding date. Having an international royal theme wedding and looking for a royal wedding cake topper? This one will be a perfect match. Just send us your ideas and reference images, we can just sculpt the very unique royal cake toppers to reflect your themes and personalities.